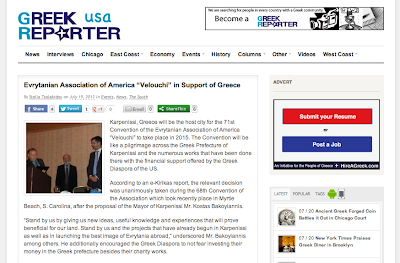 "Karpenissi, Greece will be the host city for the 71st Convention of the Evrytanian Association of America "Velouchi" to take place in 2015. The Convention will be like a pilgrimage across the Greek Prefecture of Karpenissi and the numerous works that have been done there with the financial support offered by the Greek Diaspora of the U.S. . . . "